Like any good gallivanting mother, Momalot wanted to buy a few stereotypically Thai trinkets for her brood back at home. 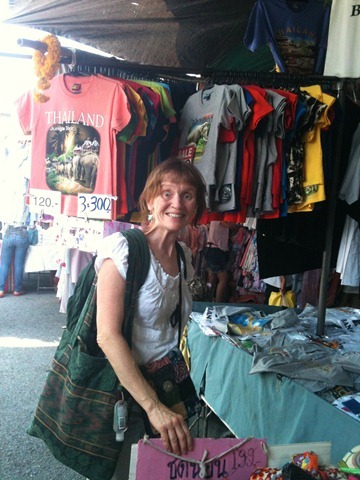 In a moment of blind stupidity, I suggested that we check out Chatuchak Market. Chatuchak is located across town from us, which in Bangkok terms means that it’s basically in another galaxy. However, it is probably the biggest market in Thailand, and maybe even the world, so it seemed like a logical starting point for souvenirs. Armed with her water bottle, rickety wooden hand fan, and gimped umbrella, Momalot figured she was ready to brave the market. Pink, gimped umbrellas: so hot right now. 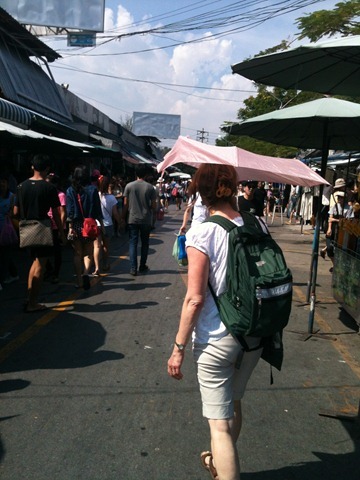 Turns out she underestimated the beast that is Chatuchak. The market is comprised of thousands of stalls laid out in a loosely structured grid. Some of the stalls are outside (as in the photo above), but many are inside, in cramped, sweaty rows that barely accommodate two Thais (let alone farangs) trying to pass each other. The whole joint is bathed in a certain ‘eau du garbage’, and the odd rat scampers over the open sewage system. 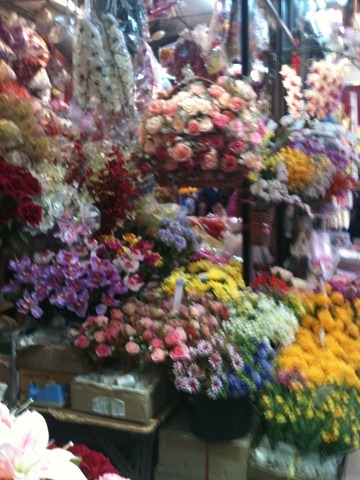 But there are many extremely attractive artificial flowers to make up for these deficiencies. The market does, however, contain basically every item known to man, from clothing to puppies to pirated DVDs, vegetable seeds, fish balls, and photos of the king. Basically, it’s the Thai version of a Walmart. We wandered for what felt like hours between row after row of stalls filled with t-shirts covered in obscene slogans. Good thing Momalot’s vision isn’t as keen as it once was. When it all became too much to process, we stopped for some tasty fried food. 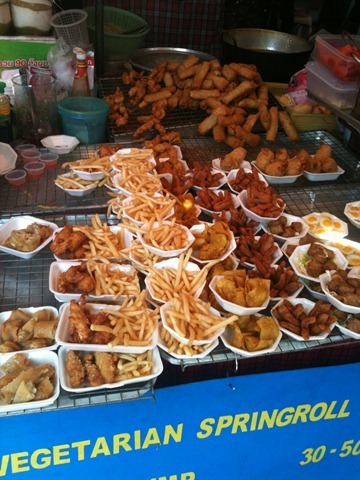 The best thing about Thailand/Chatuchak is that calories are never far away. You can’t see it, but my handy styrofoam lunch container is catching the sweat that’s pouring down my face. While Momalot could handle the rats, obscene t-shirts, and crowds, the heat really did her in. Something about 40C/100% humidity was just a little more than this gal from the Great White North could handle, and she quickly lost interest in shopping. The smile was a little forced. 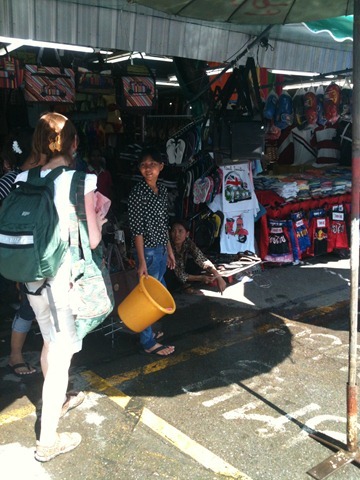 She tried to persuade these vendors to throw water on her (seriously), but they weren’t biting. She finally said “screw the souvenirs. Let’s bounce.” Ok, so those weren’t her exact words, but you get the gist of it. After very little prodding, I relented, and we clambered back on the train for the ride back to our galaxy. 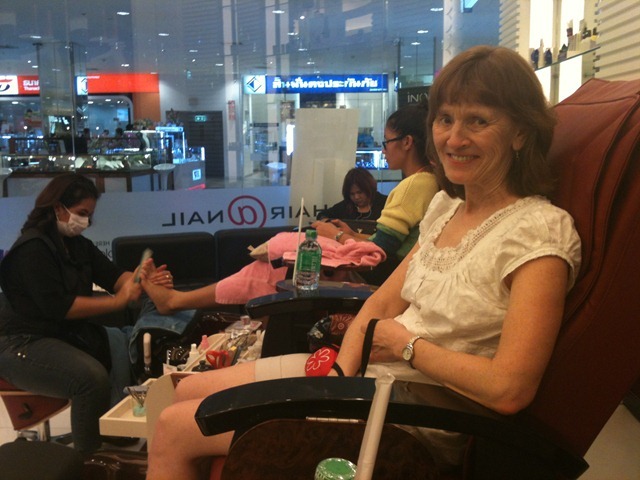 Once we reached the southern echelons of Bangkok, we decided that our equilibrium could only be recovered by getting pedicures for our nasty, battle weary feet in an air conditioned mall. Don’t worry – we tipped. And this smile is real. My gorgeous feet against a stylish backdrop of a MEC backpack and a bored boyfriend. 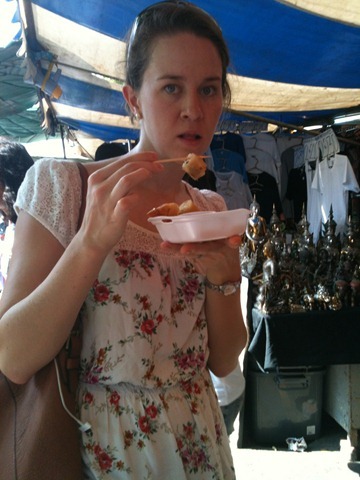 With prettified, extremely exfoliated feet, I was able to more calmly contemplate the Chatuchak experience. I realized that I have visited it approximately every four months since arriving here, because that is how long it takes me to forget the heat and horror of it all. After four months, though, my memory involuntarily resets. So if you ask me in September where you you should go to buy souvenirs, I’ll probably recommend Chatuchak. And I’ll probably volunteer to take you there. Today’s post will focus on da paddlers. Next post will talk details – river, camping, gear, surprises etc. for anyone who wants to do a similar trip. Last Sunday, T-bone gathered his two wives, David and Ruth, and headed to the Mae Tang river. No, Todd does not actually endorse polygamous behaviour, but his favourite historical paddling heroes, the Voyageurs, sure did. Every time T-bone gets near a river, he starts dreaming of being a Voyageur, and this trip was no different. For the uninitiated, the Voyageurs were a hearty group of French-Canadians who routinely paddled across Canada in the 18th and 19th centuries to collect beaver pelts from First Nations communities. They played an important role in founding Canada, and are at least partially responsible for the fact that an overgrown swamp rodent is our national animal. They also had multiple wives – city wives and country wives. City wives were the official/legal wives, and they were fine for doing city/wifely things, but when you’re on the river for months on end, you need a husky broad on location who can skin beavers/lug your boats/maybe sew you a coonskin cap or something. The concept of a country wife was just too darned convenient for us to pass up, so we nominated David for the role. The highly delineated roles of a Voyageur and his wives really worked well for our team. The tasks weren’t always traditional, but they got done with a certain je ne sais quoi that just wreaked of French-Canadian history. Voyageur Todd did his best to fill those large francophone shoes by fishing and making bannock. Sadly, he never caught anything. Perhaps this was because every man, woman, dog, child, and monk seemed to be out dredging the river with nets and spears at all times. How can fish not want to be caught by such kindly folks? Fortunately, his bannock making experiments were more successful. A nice hunk of beaver fat would undoubtedly have cranked up the flavour, but the Voyageur did pretty well with vegetable oil. He was also very good at gathering fire wood in his birchbark canoe kayak. And navigating rivers. His navigation may not have saved me from flipping my boat, but it did provide some pontificating-full photos. David had a knack for simultaneously making photogenic expressions while being ready to launch himself off the ground and haul stuff around the campsite. The perfect Country Wife. David also enjoyed hauling boats and assorted schtuff on bizarre portage routes that he and the Voyageur dreamed up. The little cow that tried to eat my arm. I think he liked the flavour of whitener-enhanced sunscreen. I like to pet dogs, but even I drew the line at this one. I conducted a variety of culinary experiments that ranged from successful to highly dubious and borderline poisonous. Fortunately, the Voyageur and Country Wife were a willing test audience. I knew that banana flowers were edible. Unfortunately, I forgot which part. Fortunately, some of the recipes worked out well, so I could hold onto a bit of City Wife cred. Roasting eggplant, red pepper, and garlic in the coals. The hair/algae colony is only on day 4 at this point. Sister wives can be friends! The trip wasn’t quite full of enough hardship/misery/beaver fat to make Todd’s Voyageur dreams come true, but at least he nailed the wife bit, and got to bellow his favourite paddling song whenever the urge hit. I have to admit, I am having a small pity party here in Thailand. While living in the tropics has its undeniable charms, the truth is that I would love to be freezing my buns off in my native land right now. I miss snow, I miss my family and friends, and I am missing Christmas. I just really want to bury my entire head in a pile of Christmas baking. Instead, I am sitting in Ikea, drinking coffee-whitener enhanced hot chocolate and listening to bad Christmas music. While I appreciate the sentiment behind “Happy Christmas (War is Over),” every time I hear Celine Dion singing it, I want to gouge my eyes ears out. Today is no exception. Woe is me. My life is so hard. Enough whining. On to happier things. This past weekend, T-bone and I went on another strange adventure, this time accompanied by The Gurus. The Gurus have many fun qualities, including their faces: all the school secretaries seem to think that Therese and I are the same person, and Eli is one of those lucky souls who could fake basically any ethnicity. Good times. The Doppelganger and the Serbo-Egyptian-Thai-Israeli-Spaniard. Therese wanted to check out a park called “The Green Lung” in Bang Krachao, one of the most unique/bizarre neighbourhoods in this unique/bizarre city. The Chao Phraya river runs through Bangkok, and at one point, it loops back on itself, creating a neighbourhood that is almost an island. Bang Krachao was settled by the Mon people in the 19th century, and the area is still a unique enclave. Apparently, it also had good parks, and we were looking forward to lounging in the grass. We took a taxi to a small pier, and jumped on the first boat that drifted by. It dropped us off in what looked like someone’s backyard. Cement pathways snaked through the jungle, and we had no idea where the alleged “park” was. “The Lung” was extremely “Green,” but there didn’t seem to be any capillaries that would lead us inside. A helpful dog from the Thai department of tourism acted as our guide for awhile, but ditched us when she realized we weren’t handing out food. All we managed to find was a sleepy village that reminded me of small town Alberta. A crew of roadside motorcycle taxis tried to be helpful, but they laughed so hard every time we wandered past them that they couldn’t properly form words. I just love bringing joy to peoples’ hearts. Ahh. Idyllic village life replete with soi dogs and yellow shorts. And later, after discovering the joys of Thai food. And then stumbled upon this gem. 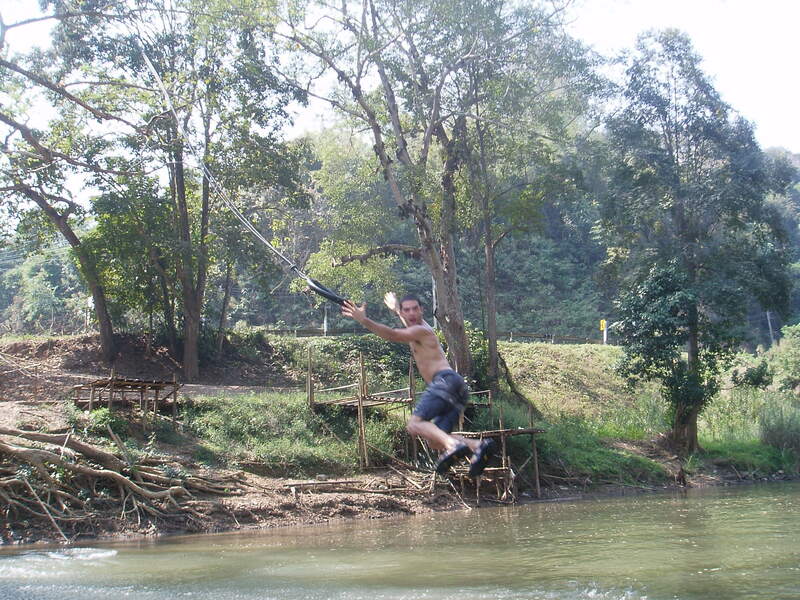 The Bangkok Tree House is a boutique hotel hidden in “The Lung,” and offered a partial redemption of our adventure. Each unit has a hammock bed on top of the roof, perfect for watching the sunset. We watched the tourists watching the sunset. Not awkward at all. We ordered a drink, and lounged under the massive trees. Other than the apple sized fruit falling on Todd’s head, it was a lovely and relaxing place. After a concerted effort (ie: using our peepers), we found the real pier, and boarded a ferry. And that’s when I saw it. A site calculated to banish my homesickness. An oil refinery, gleaming in the twilight. Bangkok may be a little short on snow and Christmas baking, but this beauty almost made up for it. Oh Alberta. I am home for the holidays.